Since we began to work more closely with ospreys in 2006, we have documented the population grow beyond the historic population estimate of 350-450 nesting pairs (Henny 1977) to a new historic milestone. In 2017, a total of 668 active nests were recorded during a statewide census of nesting ospreys, which is well above the post-DDT milestone of 500 nesting pairs, and show that the population continues to grow. This is the second census conducted without the use of manned aircraft since 2009 after all known osprey nests were released and mapped online in 2013. Despite the lack of aircraft, we’re still able to obtain an accurate representation of the size and health of the statewide population, while reducing the overall project cost. Today, the majority of data collected during a census is by citizen scientists, or “Osprey Watchers” and specially trained volunteers who observe/visit known nests and record adult activity and the number of young produced. From the data that is collected, it is used to help determine the overall size and health of the population, while engaging the public in osprey management and conservation, a key factor in the long term sustainability of ospreys in New Jersey. Results from the census indicate that the ospreys had a great year. Click to view all known osprey nests in NJ. Good weather and plentiful forage fish helped 519 nesting pairs to produce a total of 892 young, the most ever recorded in the projects history. A total of 408 of those young were banded with USGS bird bands for future tracking. On Barnegat Bay, a total of 106 young were banded with both a federal band and a red auxiliary “field readable” band to help learn more about their life history including dispersal, life span, and migratory patterns. The statewide productivity rate, which is a measure of the health of the population, averaged 1.72 young/active nest. Delaware Bay nests continues to be more productive than Atlantic coastal nests, but both are well above the minimum needed to sustain the population. The majority of ospreys (72%) continue to nest on man-made nesting platforms. The largest population gains were observed in Monmouth and Ocean Counties, where the population grew by 37% since 2013, when the last statewide census was completed. Tony Kono, who interned with us last year, conducted a project to survey osprey nests in Monmouth and N. Ocean Counties, as part of the Rutgers Environmental Steward program. He surveyed 150 nests and recorded 82 active nests which produced 91 young. It’s clear that the success of the 2017 Osprey Census is due to the hard work and determination of our volunteers! 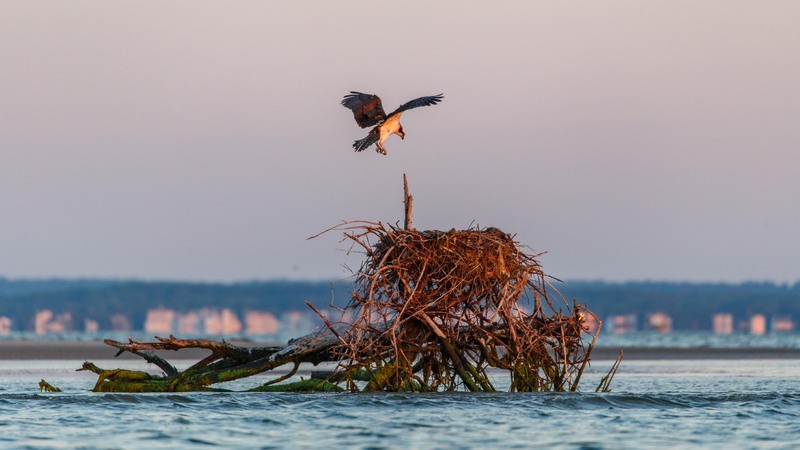 From the Meadowlands to Raritan Bay, Sandy Hook to Cape May, and west to Salem, osprey nest define our coastline, a stark contrast to 40 years ago when there were only 50 nests in New Jersey. Their ultimate recovery is due to the overall health of our estuaries and marine ecosystems, and their prey who have flourished in these areas. Ospreys have largely benefited from the preservation of our coastal saltmarshes and the habitat that they provide. As a key bioindicator of the health of our coastal waters, it is our mission to ensure the long term sustainability of the state population. This project gets no dedicated funding from the state or federal government and is supported by our generous members, grants, and private donations from individuals. Thank you all for your unwavering support! Donate to support our work with ospreys! Henny, C.J., 1977. Research, management, and status of the osprey in North America. In eds., World Conference on Birds of Prey, Vienna 1975: Cambridge, International Council Bird Preservation, p. 199-222. This entry was posted on Monday, January 22nd, 2018 at 10:10 am	and is filed under Birds, osprey, Volunteer Programs, Wildlife News, Wildlife Protection. You can follow any responses to this entry through the RSS 2.0 feed. Both comments and pings are currently closed. I live near Good Luck Point and can see them thriving and do hope more platforms will be installed. They really LOVE this area and I bet there will be a housing shortage for them this year.